There’s a word you’re going to hear being tossed around quite frequently by European automakers over the next few years, and that word is diesel. That’s right, diesel. Now that you’ve finished gasping in horror, read on. 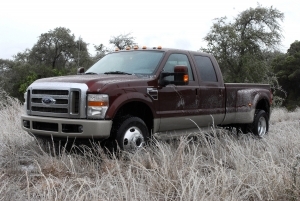 The advantages provided by diesel technology are apparent when you glance at the estimated fuel economy – compared to gasoline engines, on average, diesels manage to get around 30 percent farther on each gallon of fuel burned. And these days their engine emissions are cleaner than gasoline’s, too. In the US, however, marketing a diesel-powered car is about as easy as selling a iPhone to Bill Gates, because Americans typically associate diesel with cloud-spurting work trucks and clunking OPEC-crisis era sedans, infamous for their seemingly uncanny ability to burn more oil than fuel. Today, diesel is known for its efficient, clean-burning, high-torque abilities, all of which make an SUV the perfect launch platform. Audi is bringing its first TDI (Turbo Diesel Injection) engine across the pond in the Q7, presenting an excellent option for those looking for a large, sophisticated SUV on a mid-size sedan’s fuel budget. Fuel economy is at the core of the Q7 TDI’s appeal and it really delivers – despite high diesel prices you won’t be feeling any pain at the pump. As Audis tend to be, the interior is plush and elegant, and despite the Q7’s proportions, it doesn’t feel overly cavernous. An optional third-row of seats gives the Q7 extra people-hauling utility, should you need it. While the power delivery is a blast at full-chat, the grainy, churning diesel soundtrack makes you miss the vocal talents of a gasoline engine. The trip computer is accessed by pressing a tiny button marked ‘reset’ on the wiper stalk, which incidentally took us about a half-hour to figure out. It’s quite a thing, torque, and the Q7 TDI has a surplus of the twisty stuff. Depressing the accelerator in anything close to an aggressive manner releases a robust kick in the back that feels powerful enough to tow a 747 down a runway. The 0-60 time of 8.5 seconds is enough to make you forget that the TDI engine only revs to 4,600 rpm. Labeling the diesel as refined would be an understatement – aside from the offbeat soundtrack under heavy load and a stereotypical diesel “stallâ€ when you flip the ignition off, this feels like it’s running on 91 octane. The ride is as good as anything you’d expect from Audi, soaking up bumps well but maintaining an overall sporty feel, aided by steering that’s tight for an SUV. Quattro all-wheel drive is split 40 percent front, 60 percent rear, ensuring the Q7 is kept on the road regardless of conditions. As you’d imagine, the Q7 TDI’s engine is the real star of the show. The 3.0-liter common-rail turbo diesel V-6 engine produces a somewhat modest 221 horsepower but a brutally effective 406 lb-ft of torque. Variable-vane turbo technology is intelligently implemented, providing linear power delivery at all rpm. All four wheels are driven via a six-speed tiptronic-shifting automatic gearbox. High nitrogen oxide emissions are a common issue with diesels. To cure this, Audi has developed a urea injection system that – through a complex chemical process we’d care not to attempt regurgitating – minimizes harmful emissions. The only downside is the car will have to be refilled with urea fluid every 10,000 miles. If the stock suspension just doesn’t make your cut, a more dynamic pneumatic adaptive air suspension is available. Thanks to its flexibility, the system is able to mitigate body roll and simultaneously deliver a soft, luxurious ride. While it might sound somewhat overkill, an optional Alcantara roof liner adds an understated flair of affluence to the cabin. Audi’s Multi Media Interface system (MMI) constitutes the centerpiece of the Q7’s interior and uses a scroll-wheel and four-button interface for more efficient menu navigation and use. A side assist system can be equipped, which illuminates a light on the side view mirror if an object is detected in the vehicle’s blind spot. The light isn’t overly intrusive, and should you miss it, the system will flash back in revolt if you activate your turn signal. This isn’t your diesel engine of yesteryear. 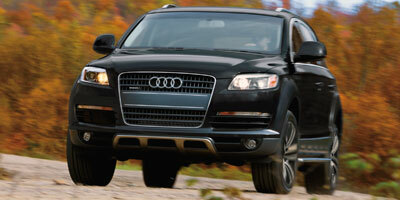 The Q7 TDI meets strict 50 state diesel requirements with an LEV-II Bin 5 emissions rating. EPA estimates have not yet been released, but the 3.0 TDI should easily be capable of 25 mpg on the freeway – an impressive improvement over the gasoline V-6’s 20 mpg highway. Consider that since the first TDI engine was introduced in 1989 emissions have been reduced 95 percent and particulates have decreased by 98 percent, and you realize how far diesel technology has come. Inside, it’s obvious this is an Audi. From the stitching to the panel seams, the attention to detail is fantastic, and all of the surfaces have a taught, high-quality feel to them. The secondary information screen between the gauges is especially useful, allowing you to view navigation details or change the radio station while passengers fiddle with the main MMI screen. While the Q7 TDI remains essentially identical to its gasoline-powered brethren, there are a few small details true nitpickers will notice. The use of a turbocharger has necessitated that intercoolers now occupy the previously vacant outer front vents – a small change, but it’s there should you be looking. Of more concern to the superficial, however, are the new 18-inch seven-spoke wheels clad with low rolling-resistance tires. Good fuel economy can’t always be pretty. Official pricing hasn’t been announced yet, so all we can give is our best guess. We do know that there will be a minor price premium to pay for the diesel engine, as there is in Europe where the car has already been released. Being as prices for the V-6 gasoline model start at $43,500, we expect TDI prices to start somewhere in the $45-47k range. The TDI’s true arch nemeses are the diesel-powered offerings from Mercedes-Benz, the ML320 BlueTEC ($48,600) and the GL320 BlueTEC ($53,400). We would also consider economical full-size SUVs such as the Chevrolet Tahoe Hybrid ($50,455) and Chrysler Aspen Hybrid ($45,570) to be competitors. While the hybrid concept has taken a foothold in the freeway-frugal US market, it’s hard to contest that diesel doesn’t carry with it the same amount of appeal. With such impressive economy (even in large, heavy vehicles), torque-heavy power delivery and environmentally friendly emissions, it offers the best of both worlds. After all, over 80 percent of Q7s sold in Germany are powered by diesel engines. Sounds like Ze Germans are on to something. If the best way to market a new product is by showcasing its real world success, Audi should have no problem selling Q7 TDIs by the thousands. 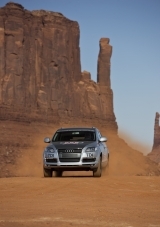 For two weeks in October, 2008, Audi put its TDI lineup through a grueling 4,800 mile cross-country test. Setting off from New York on October 6 and arriving in Santa Monica on October 19, the Audi Mileage Marathon put select members of the press in competition with each other to see who could achieve the best mileage. DriverSide was in attendance for the New York to Chicago leg in an Audi Q7, and, in partnership with Caranddriver.com, managed to chalk up the first win of the event, averaging 29.4 mpg from Manhattan to Washington DC. After a few days though, hypermiling becomes about as boring as sitting through a lecture on micro-bacterial metabolism whilst being bludgeoned over the head with Larry King’s autobiography, so we cranked it up to normal freeway speeds and still saw the better side of 26 mpg. If you think that’s impressive, consider that the international journalists in the Audi A3 2.0 TDIs were seeing upwards of 50 mpg. Still want that Prius?